We're signing off now, but keep an eye out for our report on the day's play and a Jonathan Agnew column. We're back tomorrow for an earlier than anticipated start as we look to make up for time lost to the rain. So, play starts at 7:30 GMT and we'll be kicking off at 7:15 GMT. See you then! South Africa bowler Dale Steyn, who has 3-29, on Sky Sports: "I've been wanting to get back for a while now after being injured in India. To bowl 16 overs, I'm pretty happy with how things went today. "You always want to get the first wicket, especially if that's the captain. It felt like the weight of the world was lifted off my shoulders. I was very excited - just to get going and spark the team a little bit. That's my role. "The match is kind of even. We would have loved to take a wicket or two more. That big partnership put a dampener on our side but they didn't get away from us. "Hopefully we can put them under pressure tomorrow. If we can hit our straps tomorrow morning hopefully things will happen for us." Will Lindley-Nash: People were not complaining when Trott spent hours at the crease at number 3. Compton is doing a great job. England batsman James Taylor, who made 70, on Sky Sports: "It's never ideal getting out, but so late in the day and with it getting dark, it was frustrating to say the least. "On a whole we're pretty happy with where we're at. The way Compo applied himself was excellent. The conditions couldn't have been more perfect for the South Africa bowlers. "I was trying to be as busy as possible and as positive as possible. I couldn't let Steyn settle." Kieran Gilbert: Selectors should take some credit for today's performance. Compton's inclusion has added steel to the middle order. Simon Dobson: @englandcricket going well in this first Test, getting through a testing first day. Compton and Taylor excellent, Steyn superb! "South Africa might have been thinking it would be a great day after they had got three wickets, but it's been England's day, even though they lost Taylor at the end. England will be pretty happy with that tonight. I don't think they are in a winning position, but they're in a nice position. At 49-3 they might just have gone under. But they didn't." "When Taylor gets over his disappointment, he will be pleased with that innings. He looked comfortable; he's not overawed. He feels much more at home." "As an umpire who prides himself on being immaculate on the field of play, the last place a wet ball would go is in my pocket! Generally will live in the umpires room, locked up." "Compton is under a lot of pressure. He plays cautiously. But if someone gets us through a difficult period, I'm all for it. He solidified the possible hiccup England could have had and sealed one end. I don't care about strike-rates in Test cricket." Rachel T: Well played England - intense contests need intense participants. Steyn v Compton! Puv Samra: I bet South Africa would have loved to have had someone like Compton for the India series. Dale Steyn was the pick of the Proteas bowling attack. He bowled with pace and hostility to finish with figures of 15.1-3-29-3 for the day. One of the best of a very rare breed. David Jones: In the era of batting collapses Nick Compton is exactly what we need - steady, focused and immovable rock at number three. Nick Compton ended the day 63 not out off 179 balls, but James Taylor was dmissied around 15 minutes before the close when he feathered the irrepressible Dale Steyn behind. "Hales played a poor shot on his debut - he aimed an extravagant shot at a wide ball. It was a sucker ball. That's the way he plays. But it's that sort of ill discipline that will find out at this level. He has to take a little more care and attention with his defence. We won't judge him after one innings, but if he keeps getting out like that he'll have a very short Test career." When Joe Root was out lbw to rookie off-spinner Dane Piedt, England were 49-3. However, County Championship stalwarts Nick Compton and James Taylor stepped up to the plate. They gradually blunted the South Africa attack to record patient half-centuries. "It was all about the pitch in the morning because it looked an uninviting time to be batting. When England were finally put in to bat, the pitch didn't play that badly." South Africa won the toss - I don't think One Direction had been formed when Alastair Cook last won one of those - and asked England to bat first. 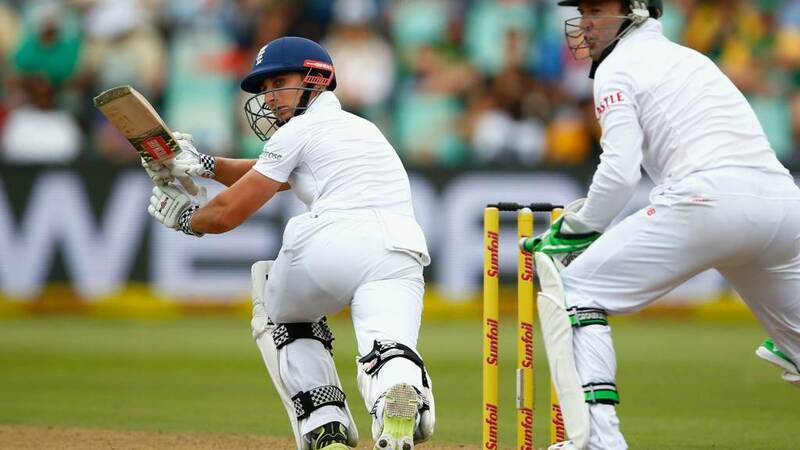 Cook fenced at one from Dale Steyn and was out for a duck, while Alex Hales was caught behind. And what a day it's been. Proper cricket, if you like. It's been more hard-fought than a night out in Wigan, but England just about have their noses in front. That's your lot, everyone. England march off for the day having scored 179-4 in the 65.1 overs possible because of rain delays. Tattz: Only the English would criticise a cricketer for being 'too intense'. LOOK AT STEYN! Dane Piedt - Piedty to his mates - is brought on to unsettle Ben Stokes with some off-spin. The all-rounder is served up a full toss, however, and it's smashed to the cow corner boundary. Superb. Roland Benham: Can anyone enlighten me on where the current wet playing ball is kept overnight. Is it put on top of a radiator? Or just left in the umpire's coat pocket? An excellent question, Roland. Does anyone know the answer? Ben Stokes is off the mark with a single into the off side. The Durham man has been clubbing runs for fun in the warm-up games and seems to relish the quicker wickets of the southern hemisphere. He just has to stick around tonight, though. "It's one of those where if you bowl that ball often enough in the corridor, you create enough pressure for people to make a mistake. Taylor played a nice innings - it's a slow pitch, you don't get full value for your shots, so I thought he worked very well." "Taylor can barely drag himself away. He walks off, head down. He has played really well but there's no maiden Test century. It was an innocuous ball." A superb knock is ended by a champion fast bowler. While the rest of his team-mates seemed to have their mind on dinner reservations, Dale Steyn had other ideas and delivers a little tempter which James Taylor nibbles into the hands of the keeper. Ben Stokes is the new man to the crease. "What a piece of timing. For all the money in Durban you just thought he was trying to flat-bat that along the ground. But it sailed away..."
Dean Elgar is bowling some rubbish. He drops short to James Taylor, and the man with the bulging biceps muscles a maximum over mid-wicket. "If I'd put England in to bat, I would have wanted five or six wickets by the end of the day." I've just clocked the best flag EVER draped over the stands. It's a collection of beer towels sewn together into one big banner. Some of the best breweries - some old, some new - make the cut. Jonathan Bayes: Slow and steady from@thecompdogand@jamestaylor20but good stuff for England. Proper Test match cricket. Scott Lennon: Would you rather have 100 runs off 300 balls, or 50 off 40?? People need to learn the difference between Test and one-day. The Kingsmead pitch is a dirty dark brown in colour and looks to be holding enough moisture to keep the bowlers interested. England are taking few chances so close to the cut-off time of 16:00 GMT. Just some good running between the wickets. "England have to make do with what they've got. They've not got the great payers of the past, but they have to get players who make a team." Mark Pettman: Never quite understood why @thecompdog was dropped in the first place. Delighted to see him back and scoring. I bet Nick Compton's one of those blokes who gives nothing away at work, but lets his hair down in style on the Christmas Do. Every office has one of those people. Two singles as England continue to advance nicely. Jason Truman: Re 14:39 and Danny's pork pie - can we check if he's eaten the other half now? Nick Compton hits only his fourth four in 160 or so balls of batting. He punches Dean Elgar through mid-wicket but still there's no smile. You can sense there's one being suppressed below the surface, mind. Robert Wolf Petersen: Only slight concern with Compton is that he may be TOO focused, a la Ramprakash. Maybe he should go on Strictly Come Dancing. "Morne Morkel has got other strings to his bow, but in South Africa he reverts to type and bangs it into the middle of the pitch. He's more of a caught-behind man than a leg-before man." That's either stunning judgement of his off stick, or Nick Compton just got away with one. He leaves the ball on length - Mike Hussey-like - but the cherry sails perilously close to knocking over the yellow stumps. The bowler, Morne Morkel, can't believe it. "England have dug themselves out of a hole. However, when we played here in 2009, batting was very easy on days two and three when we batted - and we won." Dean Elgar took four wickets in the first innings of the first Test in South Africa's recent tour of India, including Che Pujara and Ajinkya Rahane. He's no mug. He grunts as he releases the ball, like a tennis player returning a heavy serve, but Nick Compton is on easy street. Just a single. Geoff FP Guitar: If Bell had batted as slowly as Compton we'd have been saying he was off his game and calling for his head. "After 50-odd overs, the pitch is spongy, like a plate of rice pudding. It's going 'boing', plop." "That shot from Taylor was like he hit the ball with a pair of rolled-up socks. He gave it everything and it went nowhere." James Taylor is such a powerful pocket dynamo. He brings up the 100 partnership, off 227 balls, with a crunching cut through point. He's got Popeye-like muscles - and it shows in his ability to wallop a cricket ball. Jacob Arthur: Super stoked for Compton's gritty performance (slightly intended pun). Room for a quiet focused man in world of sport after all. "Nick Compton has reminded us what he can do. He's solid and he's got a good technique." "Nick Compton has batted for four hours and hit three fours." Nick Compton brings up a hard-earned half-century with two through the covers. Gerard, London: Surely the only real question surrounding Compton is whether he has an extra gear, when required? "The South Africans just seem to be willing to sit back and let something happen here." Am I allowed to say that there's comparisons to be drawn between James Taylor and Joe Root? Like Root, Taylor is busy at the crease, runs well between the wickets, has a solid defence and appears to have an appetite for runs. South Africa have run into a brick wall here. England's middle order hasn't been this solid since Paul Collingwood hung up his blocker. Jay: Compton has only just got back and people are already focusing on his strike rate. With their recent collapse stats, England need him. Stuart Mitchell:I know hes only just come back into the side, but why not try Compton opening again? Does look the part, Taylor/Root 3/4 Hales 5. Mr H: What's wrong with Cook, Compton, Taylor, Root, Hales? South Africa turn to another part-time spinner, this time Dean Elgar. The slow left-armer has a classical action *(sorry!). This is Kyle Abbott's favourite ground - he's taken more first-class wickets (56) here than anywhere else, Nothing to see here - another maiden over. "Compton's bound to feel extra pressure because he's been left out, he's got back and he'll be wanting to make some runs and keep his place. But his natural inclination to be more defensive." Nick Compton must spend so much energy out there when batting. He's so focused. There's a little appeal for a caught-behind, but the ball flicked the pads. Not out. "Nick Compton's strike-rate in Test cricket is 34. In the County Championship it is 47." Hugh, Shipley: Compton looks the part. Hales would be better at 4 or 5 but there is no vacancy. The outfield is about as quick as a Louis van Gaal news conference - England just aren't getting full value for some punchy cover drives. Three from it. James Gutteridge:Re 46 overs. James Taylor second tier? I'll have one of whatever Graeme Smith's drinking. Adam Becket: I think James Taylor is my new favourite England batsman. Ben Stokes is the next man in and he's caught napping by the television cameras. He retained his dignity though - no wide-open mouth, sticky out tongue or saliva dripping from his chin. It feels like England are beginning to play for the light now. Nothing silly, take the singles when they can. "I can see the problems with England's batting. Some of them have been found out in their techniques. You can't go on having collapses and keep expecting to win Test matches. They've been inconsistent. "They have to make do with what they've got. They've not got the great payers of the past, but they have to get players who make a team." Kyle Abbott looks like somebody who might have played for Wimbledon in the early nineties. I don't know what it is, but he looks like he's had a few pints down the years with Mick Harford, Alan Cork and Vinnie Jones. He's a good bowler, mind. As third seamers go, there can't be many better. He's angling the ball back into the right-handers. Just one from the over. Danny Cash, Brentwood: I have already smashed half of a huge Melton Mowbray pork pie listening to the fightback. Will only have the other half if these two post 50 each. C'mon lads. I'm glad Dale Steyn has consigned the long hair and headbands to the dustbin of history. It just detracted from his menace. Nick Compton looks like he's going nowhere fast. He's playing a fine hand, and is only denied a cover boundary by some typically athletic South African fielding. These two teams are locked in stalemate at the moment. Both are evenly matched and are grappling on the floor like a pair of jack russells. The dogs, not the cricketer. Everyone knows there's only one Jack Russell the cricketer! Boski: Dale Steyn's haircut is truly naff. (What to say if you can't criticise the bowling). "Dale Steyn is such a timid man, a lovely man off the field, But when he crosses that line something just flicks in his brain." Seamer Kyle Abbott replaces Dane Piedt. Compton collects an off-side single off the first ball but that's about it. The atmosphere becoming a little subdued at Kingsmead. "If you're in the England dressing room now, you'll be happy. Before the series people were saying, who's going to step up? It's not Cook or Root - the recovery has been done by two second-tier batsmen." Dale Steyn is sporting a fluorescent pink strip on his elbow. Like he wore it for a party and has forgotten to take it off. He's tearing in, sending the ball down at around 93mph. Not that James Taylor is too bothered. He drives the fast bowler down the ground to bring up another half-centry. Stand and deliver. James Taylor unfurls a powerful cover drive when Dane Piedt pitches up. "With Compton, it's almost like the glue is coming out of the top of his handle, he's that intense. He's certainly got the talent - he's got to find the relaxed place where he can perform." That's really interesting, Ursula. Feel free to email in again and tell us what the two men were like, and even feel free to chuck in the odd anecdote. Both look like they might have had drive to reach the top from the very start. England dealing in singles at the moment. That's all they need to do. Ursula Eyles: I wonder how Hashim Amla is feeling watching his old Durban High School mate Nick Compton deny him here. The two played in the same teams as young cricketers. I captained the two of them and another future Test cricketer Imraan Khan, all in the same Reserve League team in Durban when they were about 14 or 15 years old. South Africa keeper AB De Villiers is noisy behind the stumps, shouting encouragement to Dane Piedt. Nick Compton, as he does, pats back a maiden with the minimum of fuss. "I would have liked to have seen more aggression from the South Africa attack - the seamers could have used the short ball a bit more. It has been a day of attrition so far." Football Fragmento: It's easy to forget that this is James Taylor's 4th Test match. Feels like he's been in the team for ages. Morne Morkel stands at the top of his mark, beside a pile of sand which resembles a molehill. He's going round the wicket and targeting the ribs of Nick Compton, who pulls a single. Another good, challenging over. Statto (Ken): Not sure why you think Amla will be worried? Always add two wickets to the score... 121-5 and Moeen Ali, not for the first time, will be under pressure to rescue a match. A good last session needed by England. James Patrick: After Compton and Taylor, Woakes will take a 5-for now to complete the hat trick of 'England players unfairly written off'. It's time to get the evening session under way. The locals reckon we've got an hour of play left before it goes dark. England will want to be 40-0 better off. If South Africa take a couple of cheap wickets, they take control of the match. "Graeme Smith - every time he went out to bat - would say to the umpire 'Good afternoon, sir. Middle stump please'. It was a very nice, gentlemanly touch." This next entry from Graeme Swann is pretty random... but an interesting insight. "This wicket won't deteriorate. It will get quicker over the next couple of days and will actually get better to bat on." James Vigar: Compton is proof that timing is everything. Victim of a regime with ideas above its station and now seen as a key player. Jim: Always liked Compton. Thought he was unfairly dropped after the New Zealand series. Nick Compton brings a real steel to this England middle order. James Taylor, for me, is just a very special cricketer. He's brilliant. There's no other way to describe it. Thanks Justin! It's all looking good for England now, isn't it? And how ironic that the two men leading the fightback are the two who the selectors seemed ignore for long periods. Not any more. Marc Higginsonwill take the reins for the final session, which is scheduled to finish at 16:00 GMT. Enjoy. "Compton and Taylor have worked hard, had some real success and just before the tea break the scoreboard was really starting to tick along." This has been an admirable fightback from England, who were 7-1, 12-2 and then 49-3, with Alastair Cook and Joe Root back in the hutch. Nick Compton, defiance personified, has 40 on his return to the Test side, while the resourceful James Taylor has moved stealthily to 41. "There's an announcement in the ground that the bars will be closed 'for a cooling off period', on orders of the local police. Have they not met the Barmy Army before?" A boundary, England's first for 10 overs, as Taylor gets down on one knee to sweep Piedt powerfully. And another one, making room to cut through point. A scarcely believable 10 off the over and the worry lines on Hashim Amla's face grow a tad more pronounced. And that will be tea. "Nick Compton won't have faced bowling like this in county cricket - the height, the pace, the angle, the field..."
Van Zyl attempts to gee Morkel up from the slip cordon, which is now down to two members. Taylor, who rarely misses an opportunity to score off the back foot, swivel-pulls for a single to a deepish mid-wicket. Does that field suggest South Africa are on the defensive? Not quite, but England's position is improving by the over. Compton ducking as Morkel goes round the wicket. Hugh: Given England will inevitably be 50-3 in every innings, why not put the bowlers at the top of the order so there are more batsmen left to help the rebuild? From the tall, gangly Morkel at one end to the tiny Piedt at the other. From pace and steepling bounce to gentle twirlers. Don't you just love cricket...? Taylor nurdling, England building. "Morne Morkel is a very good bowler. His angle was awful for me, there was never any width. He was on my list of bowlers I hated facing. I almost couldn't wait to face Dale Steyn at the other end." A finger stinger. Morkel extracts lift from this pitch and Taylor is struck on the bat handle or bottom hand as he blocks. But he's still there. Morne Morkel returns to the attack, Compton pulls a single to take England to three figures and wicketkeeper AB de Villiers takes one on the body as he tries to collect the throw from the outfield. It's notable only because South Africa have been so tidy in the field today. Paul Hawkins: This partnership is Taylor-made, straight outta Compton. Scott Fowler: Compton has many Trott-like qualities. If he turns out a run machine like Trott then it's a big bonus for England. Shamim Miah: Players dropped by England often return with big performance & determined. Both Compton and Taylor looking good. Taylor unfurls a deft paddle-sweep before Compton brings up the fifty stand with another single. Well batted, chaps. Tea is 20 minutes away. Can they make it? The fair-haired Van Zyl, a solid-looking character who you suspect would be a handy rugby player, continues with his probing line on or outside off stump. Compton treats him much like he would a bowling machine: front foot forward, firm drive, admire the shot, no run. "Compton is not looking comfortable at all at the minute. He looks jittery and his timing has gone." Oooh. A scuttler from Piedt keeps low and Taylor jams his bat down on it - French cricket-style. Compton survives an appeal at short leg - not bat there - before he makes the most of a rare misfield at square leg to gather a single and move to 30. "Some players come back stronger and better after being left out. It doesn't follow that it is the end of your career after being dropped. Compton spoke to me in the summer, asking what he had to do to get back in the side. I said I didn't know - the only person who does is Andrew Strauss. The lad had desire to play so he needed to talk to the man who had the say." Is this a sign that South Africa are struggling for answers to the Compton-Taylor conundrum? Stiaan van Zyl, opening batsman and part-time medium-pace trundler, is thrown the ball. Actually, he's lucky to be called medium-pace. Graham Gooch-esque. But good enough to beat Taylor's outside edge with the final ball. "England's position is still precarious. After being put in it is the worst scenario you would accept. I don't think Compton has quite got the balance yet of occupying the crease and also taking the game to the bowlers. When you have 20-odd off 80 balls it is when the pressure starts to build, as you feel you should be scoring more. South Africa will know the reason Compton got dropped and will want to keep the pressure up." James Taylor almost looks sub-continental at times, such is his penchant for the leg side with those rubbery wrists. I bet he has a mean table tennis forehand. One off that over from Dane Piedt. Compton and Taylor deserve immense credit. Coming together at 49-3, they have helped avert a collapse with a watchful partnership that is approaching 50. Against the best pace bowler in the world. And his not-too-shabby mates. On a seamer-friendly track. Ben Thapa: England need one of these two to make a ton if they're going to post a competitive first-innings score. Adam Napthine: Can anyone explain why Compton (an opener) is at 3 and Hales (bats at 4 for Notts) is opening? Dane Piedt is getting the odd one to rip - which can worry a batsman more than playing on a raging Bunsen in Mumbai. After James Taylor is deceived against one such delivery, the right-hander uses his feet to get to the pitch of the ball. When the bowler drops short, he stays back and pulls four. Make that two fours in the over. Good batting. Compton in a nutshell in that over: five dot balls followed by a forcing shot off the back foot behind point for four. Patience followed by punishment. Cool as you like. AADZ: Good to see James Taylor finally been given a chance. Andy Flower was terrible towards this lad! #talent #persevearance. There's no sign of the turn Piedt found to get Root. Taylor blocks, Taylor dances down the pitch and thinks about a single, Taylor squirts one to mid-wicket. A maiden. South Africa need a wicket. Who do they turn to? Off-spinner Dane Piedt, of course, he who removed Joe Root with his first delivery earlier on. Jay: Compton is exactly the sort of batsman England have been missing for a while. Grind it out, bore the opposition to death, score. Charles Duncan:Choice to switch Compton and Hales? Compton is calmer at the crease could make sense. But feel sorry for Cook now. Taylor scampers like no batsmen I've ever seen, a hamster in a wheel as he sprints a single and is almost taken out by Dale Steyn's throw from mid-on. Compton latches on to a rare half-volley from Kyle Abbott, the ball fizzes past mid-off for four and he affords himself an insouciant lean on his bat as he and Taylor shoot the breeze. "You feel if the batsmen don't make mistakes, it might take them longer to get the runs - say their first 40 or 50 - but once the newness of the ball goes it will be difficult to bowl a team out." Morkel full and fast. Taylor working to leg. Missing. An appeal from the slips. Less confident much from the bowler. A shake of the head from the umpire. Taylor and Compton keep it ticking over. "Taylor just needs to be careful here. He has ability and confidence from playing in the one-dayers, but don't go too much and give it away." TV cameramen working on Tests in South Africa are never short of material in the crowd - let's just say they seem to pick out the ladies working on their sun tans. This time, they find three chaps wearing vests with a leopard-skin design. Hmmm. A crunching cover-driven four for Taylor, off Steyn no less. Brilliant work from Temba Bavuma at short leg. For the second time in the match, Compton has to hurry back into his ground as Bavuma gathers then flicks the ball towards the stumps - it flicks the bails but Compton's bat is over the line. Close. Very close. Compton, his left shoulder pointing to mid-on as he stands bolt upright, sees off another testing over from a fired-up Steyn. A play-and-miss off the final ball. That scowl could make children cry. "Short sessions suit South Africa. They will have an hour of bowling before another rest and change of clothes. Perfect." Tom in Zurich: A reminder that the average first-innings score here is just 301. So being put into bat and struggling initially against the best pace attack in the world is hardly a disaster. What on earth was that? Morkel, one of the tallest bowlers in the world, is pulled straight back down the ground by one of the smallest batsmen. The ball ended up flying between bowler and non-striker for four but Taylor was in control, no doubt about it. David 1, Goliath 0. Morkel pins Compton above the pad on the back thigh with one that nips back off the seam. Compton and Root can compare bruises at the dinner table later on. Morne Morkel to Nick Compton. Play. "England's batsmen are returning and the lights are on." Is Smith considering a comeback? "I have signed to play in the Masters Champions League and a lot of it has come from that. Retiring at 33 leaves you with that feeling in the back of your mind that you could still do it. It is not something I am thinking about and I would have to have an unbelievable Masters to even consider it." Earlier this week, my colleague Marc Higginson compiled this little infographic. In case you haven't seen it, check it out. Stats do not include today. As the tractor drags the rope round the outfield, news reaches us that play will resume at 12:18 GMT. Very precise. One of the accusations levelled at Nick Compton in the nine Tests he played before he was dropped was his pedestrian scoring rate - he managed only 34 runs per 100 balls. But his obduracy has been invaluable for England today. He has faced 45 balls for his 12, and struck one boundary in 18 overs at the crease after coming in at 3-1. Most importantly, he has an asterisk next to his name on the scorecard. Just what do they look like? That's Stuart Broad and Joe Root if you hadn't realised already. The pair sat down with BBC Sport recently to discuss England's Ashes victory for a special 5 live programme.Watch it here. Before I get bombarbed by angry tweeters, I'm only kidding. But what do make of England's new-look batting line-up? Were South Africa right to bowl first? And just how good is Dale Steyn? Get involved using#bbccricket, emailtms@bbc.co.ukor text81111. So while we wait for the rain to stop, what have we learned today? Alastair Cook can't bat for toffee, Alex Hales is not up to Test cricket, Joe Root is on the slide, Dale Steyn is pretty good. Oh dear. Just as it was getting interesting, the rains starts to fall again. The fact the players are merely ambling off tells us it's not heavy, but that's not what anyone wanted. Spare a thought for Dane Piedt - one over, one wicket, one run, then: "Take a blow." A short leg comes in to Taylor, whose response is to produce the shot of the day, a firm pull off the world's number one bowler that fizzed to the square-leg fence. Emphatic. Dale, shall we say, doesn't look best pleased. "It looks like Hashim Amla has recognised that another wicket could be a game-changer by bringing back Dale Steyn. If there is one man who can get that wicket it is Steyn. The last thing you want to do is use Dale all the time. He is not that kind of bowler. Other people have to work for him so you can use him at the right time." Abbott is finding a hint of swing back in to Taylor, who defends stoutly, albeit with a hint of bottom hand as he works it to leg. The oohs and aahs from the South Africa slip fielders can be heard after every ball. Gripping cricket - no freebies on offer here, Christmas or no Christmas. "This England line-up is amazing. It's as though they bat down to number 12." James Taylor, playing only his fourth Test, replaces Root. England are in the mire. 'Titch' has shown he's got the ticker for international cricket from what we've seen, but this is another level altogether. He's off the mark by using his feet to Piedt. The 50 up for England. "That is a big boost for Amla and Piedt as well. For a spinner to roll up first delivery and take a wicket, especially a man in form like Root, takes an awful lot of pressure off you as a captain." Has height saved Root here? Nope. Ball-tracking suggests the ball would have hit the top of middle stump. England's main man has gone. Inspired captaincy from Hashim Amla. Would you believe it?! With his first ball, Piedt finds turn. Root plays back. The ball strikes him on the back pad. And the umpire's finger is up... Root reviews it. So, 18 in and we have spin in the form of offie Dane Piedt - the man who many thought would not play today and if South Africa had plumped for four seamers. "South Africa just need to be patient, use your short balls effectively and play to your plans. But other than that you need to make life difficulty for someone who is in form like Root. You need to try and make him take something on that he otherwise wouldn't." After a minor problem with something behind the bowler's arm, Root ends the with a pinched single. Given the circumstances, England's running between the wickets has been impressive. Take that! Abbott is a smidge short, Root rocks back and fairly wallops it over midwicket for six. That went flat. And hard. The counter-attack is on... Maybe. "With Durban being cloudy you expect bad light to play a part later. So this session before tea is vital. It has been a slow bounce today and Root has looked class, including guiding that one down through gully. Batting is all about confidence and Root is a man who understands his own game and is in control." Root could have done worse than bring a copy of the Yellow Pages to stand on today - both his feet are off the ground as he defends another lifter from Morkel. He follows it up with a controlled cut/force between point and gully. Lovely, Joe. The first boundary for six overs and only the third of the innings. Partnership worth 30 now. "It is intriguing cricket at the moment. Bowler-friendly conditions and they are putting them in the right spot. Root and Compton don't look entirely comfortable but they are weathering the storm." Abbott continues to barrel in, his hair drenched with sweat. Or maybe he's gone for the wet-look gel today. Bang on the money - targeting the top of off stump. Slim pickings for the batsmen at the moment, the run-rate a mere 2.31 an over. New Zealandcruised to victory in their opening one-day international against Sri Lanka overnight. The visitors never recovered from being reduced to 27-5 and eventually folded for 188. The Black Cats rattled along to their target, completing the chase in just 21 overs as skipper Brendon McCullum smeared 55 off 25 balls. Compton just about evades another rip-snorter of a short ball, but is alert enough to push three wide of mid-off when Morkel goes fuller. Root then gets away with an edged drive wide of the three hungry slips. A blow to Compton's hip to finish the over. This is absorbing stuff in conditions that are firmly favouring the seamers. South Africa sense wickets. David: Why is Hales getting so much stick? Lost toss in bowling conditions played himself in a bit. Off for rain, very tough on debut . Rob Meech: Writing off a man's Test career after one innings - is it 1995? Pathetic. Compton, deep in his crease, is much as I remember him when he last played for England: compact, watchful, minimal yet precise foot movement, negligible backlift. He's drawn forward by Abbott.... and watches the ball zip past the outside edge. A puff of the cheeks all round. "Disappointing for Alex Hales. It was a leaden-footed drive. It is fuel for his detractors. I wouldn't read too much into it, though. I'm sure he will have a good score this series." Morkel, back into the attack after that change of ends, finds lift and has Compton taken at short leg. Or does he? That looked - and sounded - in real time like a regulation catch, but the appeal is muted and replays showed the ball missed the bat. Good job I'm not umpiring. Compton surviving. Just. Oooof! Abbott, replacing Morkel, finds extra bounce and Root - on his toes - is fending one off towards the slips. It lands short. The South Africa quicks have got steam coming out of their nostrils today. Maiden over.